Is Obama the Next Hoover or the Next Nixon? Is Barack Obama evolving into Barack Nixon Obama or Barack Hoover Obama? The only thing that has kept the staggering economy in somewhat positive ground statistically is the Federal Reserve's easy money policy and Congress's refusal to add any new major programs or increasing tax rates since 2010, but beyond that, it is difficult to find any policy that Obama has pursued that would lead to any sustained growth. With Europe barely hanging on, this administration may be one more disaster from the whole house of cards crashing down. Obama inherited a slumping economy but his policy has delayed a sustained recovery, and with job creation virtually nil and fewer people working as a percentage of the workforce, Obamanomics has been a failure. Even his own deficit commission rejected his approach and instead moved closer to Reaganomics. Obama is playing hardball with Republican donors but make no mistakes, his attempt to defund GOP Super PACs is Nixon-like. 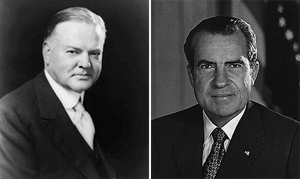 As for a Herbert Hoover lookalike, Obama's policies are leading to a potential disaster for whoever is elected. With massive budget deficits needing to be addressed, a disastrous health care plan that will add even more to the budget deficits and a massive tax increase across the board affecting every American ready to go into effect in 2013, the new President will act fast to avoid a massive recession. This doesn’t take into account a major economic failure happening in Europe that ripples through the United States and leads to a major economic crisis. Obama has been willing to threaten Republican donors to show that he plays by a different set of rules not seen since Richard Nixon, and no one has managed a recession as badly as Obama in the post-World War II era. Take your pick, Barack Milhous Obama or Barack Hoover Obama?